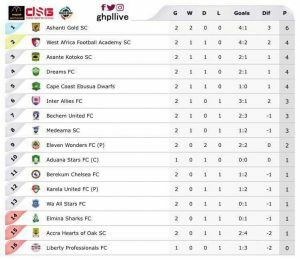 The 2017/18 Ghana Premier League entered week two across all eight league centers with two games being honoured on Saturday and six coming off on Sunday. On Saturday, Accra Hearts of Oak got tumbled by Obuasi Ashanti Gold SC by 3-1 at the Cape Coast Sports Stadium in their first home game of the season with goals coming from James Akaminko, Amos Addae and Shafiu Mumuni for Ashanti Gold with Joseph Esso getting a consolation for Hearts of Oak. Wa All Stars shared spoils with Ebusua Dwarfs at the Malik Jabeer Park in a 0-0 draw game. On Sunday, West African Football Academy, WAFA, annihilated Liberty Professionals at the Carl Reindorf Park by 3-1 kind courtesy Aminu Mohammed, Richard Danso and Charles Boateng. Brite Andoh got a consolation for Liberty Professionals. Asante Kotoko SC won by a goal to nil through Obed Owusu who connected well to Emmanuel Gyamfi’s cross to give the game the only goal on the 56th minute. Dreams FC couldn’t hold on to their one goal lead scored by Samuel Pimpong when Stephen Amankona restored parity for Berekum Chelsea at the Golden City Park on the 93rd minute for all to go home with a point each. Bechem United triumphed over Medeama SC by 2-0 at the Nana Fosu Gyeabour Park with Seth Sowah and Emmanuel Owusu registering their names on the score sheet for the home side. 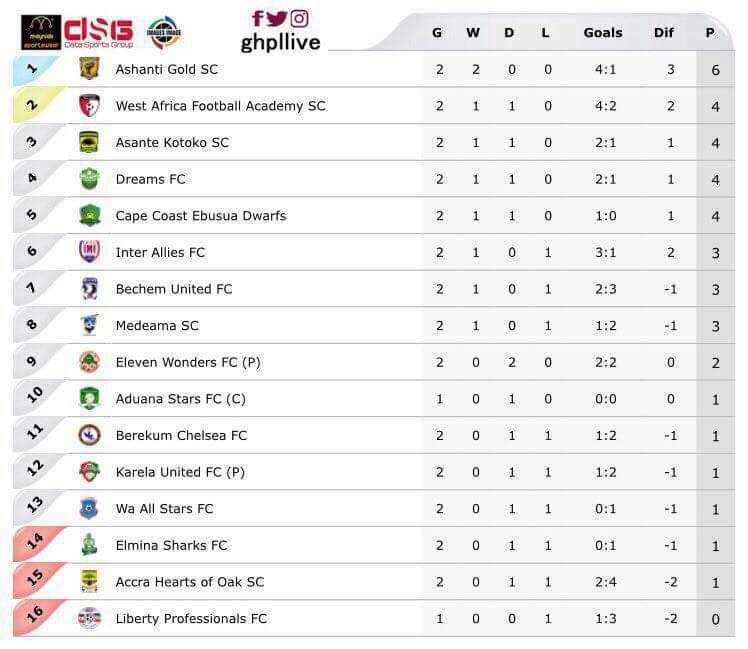 Elmina Sharks sat home at the Nduom Sports Complex to play a barren game with defending champions, Aduana Stars. Karela FC came from behind to pick up a point at Aiyinase in all debutants encounter in a 1-1 draw game. William Opoku cancelled out Abdul Wahab’s first half goal. Ghana Premier League continues on Wednesday and Thursday in midweek fixtures for Match Day 3 encounters across all eight league centers.